Is The New Design On The Bodymax B15 Exercise Bike Strong Enough? The Bodymax B15 Exercise Bike is a new design from Bodymax to add a little more to this spinning bike. It is angular and black and yellow to stand out from the crowd. There are high hopes of a good spin bike that gives users the workout that they need. The specification talks about the adjustable seat and handlebars, and the promise of comfort. There is plenty here to tempt buyers in, but it it all enough? Was The New Design Of The Bodymax B2 Exercise Bike Worthwhile? The Bodymax B2 Exercise Bike is sold as being a new design, which suggests that there are some improvements to the shape and capabilities. There are transport wheels for storage, a compact shape design to save space. 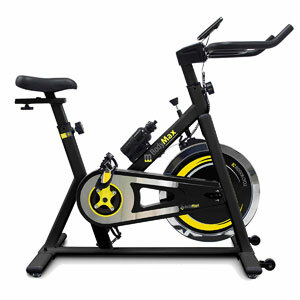 The spin bike has a 13kg flywheel for a strong performance and fun yellow accents which looks good. It is the sort of model that stands out to potential buyers in the market for an additional to the home gym. Has it proved to be a worthy option in modern design?